Wash the Potato and peel off the skin. 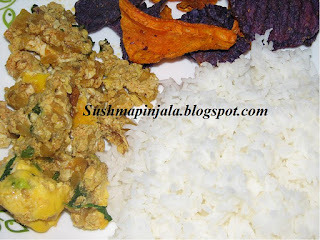 Most people do not peel off the potato for making bhunjia. Cut the Potato into Small pieces. 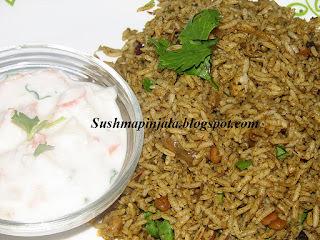 Heat oil in a frying pan and sprinkle the panchforan or jeera. 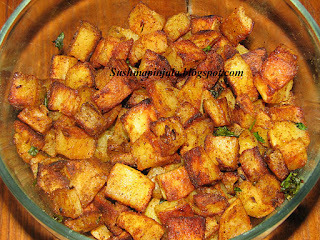 As the panchforan begins to splutter, put the washed potato slices also into the pan. Increase the flame to high and saute the potato for 2 minutes. Now put the powdered masalas into the preparation. Continue to saute for next 3 minutes. Cover the panwith lid, and reduce the flame to low. Leave it covered for 5 minutes. Now add salt to the preparation and saute thepotato on medium flame for 5 minutes. Then reduce the flame to minimum and cover the pan. Wash the paalak with water 4-5 times. Chop off the leaves and wash again. Boil the daal with salt and 1tsp haldi powder in 500 ml water, pressure cooking on medium flame for 5 minutes after the first whistle. Let the pressure cooker cool down, then open it and add the chopped paalak to it. Pressure cook the whole thing for 3 minutes after it starts to whistle again. Heat the oil in tsmall pan. Put jeera, tejpatta, garlic flakes to it. When the jeera begins to splutter, add chopped onion. Saute for 4 minutes on medium heat or till onion turns transparent. Mix the ginger garlic paste to the onion. Mix jaggery, water, and green cardamom into a watery solution. Mix 4 tbsp ghee, jaggery syrup prepared above and coconut to wheat flour and make dough of it as chapati dough. Use only as much jaggery syrup as required to make dough. Take a lump of dough (the size as that for making chapaatis), press it flat on your palm like a peda then press it against a saancha for making khajoor. In many families, Khichdi is necessarily prepared on Saturdays. The reason being the strong belief that eating Khichdi on Saturdays protects humans from any ill effects of "Shani Grah" the planet Saturn. But the spicy khichdi with its accouterments is enjoyed for its delicious taste that goes beyond the traditional reason for eating khichdi. The dish is widely prepared in many Indian states like Bihar, Jharkhand, Uttar Pradesh, Orissa, Gujarat, Maharashtra, and Bengal Vegetables such as cauliflower, potato, and green peas are commonly added. A popular variant in coastal Maharashtra is made with prawns. Boil potato's peel the skin and mash with potato masher. In a pan heat oil and add cumin seeds. When cumin seeds splatter add chopped ginger garlic and fry for 2 minutes. Now add mashed potato and salt. Mix well and cook further for 5 minutes. Now add chopped cilantro and roasted red chili flakes. Mix well and keep aside. Now make smooth dough adding water to wheat flour. Now take some portion of the dough and roll as parata. Now stuff the potato curry and close from all the sides. Now further roll it as a paratha. Heat tava and cook paratha on both sides. 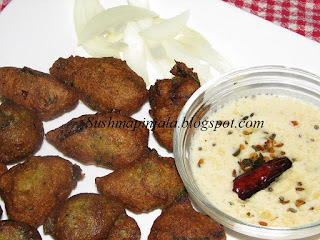 Serve hot with and pickle or raita or plain curd. Check blogging marathon page to see what my fellow bloggers are cooking for the BM #11. 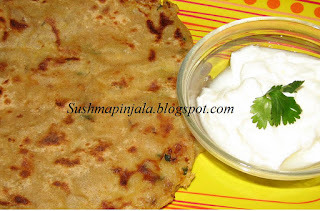 Also sending this recipe to Vardhini's LGSS- stuffed paratha event. Wash and dry brinjal. 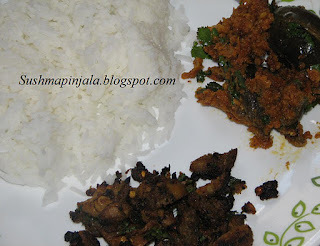 Apply oil to baigan/ brinjal and make some slits with knife and roast it over flame. Peel the skin of and mash it with the potato masher. Heat oil add chopped onion and chilies. Cook till golden brown and add mashed baigan. Mix well and add cilantro, salt and mash further. Serve hot with dal rice, or khichidi or roti/ paratha. 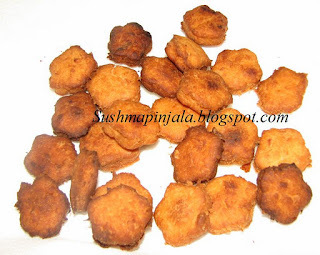 Mix all the ingredients to smooth batter to make pua. Make sugar syrup by adding water an sugar. Add powdered elachi/ cardamom. 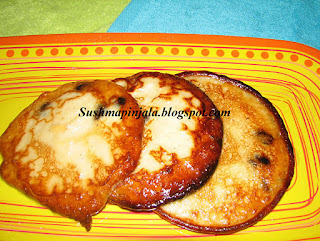 Heat ghee / butter in a pan and put 1/4 cup of batter to form a round pancake. Deep fry till golden brown and strain oil. Repeat with rest of the batter. Keep the pua in a serving plate and just before serving heat the syrup again and dip the fried pua for a minute. Now the pua becomes Malal pua. Strain the sugar syrup and serve hot. Heat water in a vessel and put in the tomatoes and let it boil. Remove from heat when the skin starts peeling off.Drain. Cool ,peel and puree the tomatoes and keep aside. Heat oil in a pan and put in mustard and jeera. When they crackle add curry leaves, garlic and chilies. Saute for a few seconds and add onions . When they turn translucent add the pureed tomatoes and bring to a boil and simmer. Add salt, haldi and chili powder. In a sauce pan add water, chopped cilantro, haldi, salt and chili powder. Remove and keep aside 1 spoon chopped onion and add rest of it to the water and bring it to boil. Boil for 15mits on medium flame. Now prepare tadka/ tempering. Heat 2 spoons oil and add mustard seeds, cumin, red chili, curry leaves, udad dal, fenugreek seeds , chopped 1 spoon onion and coriander seeds. 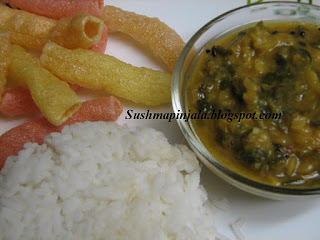 Add this tempering to rasam and serve. 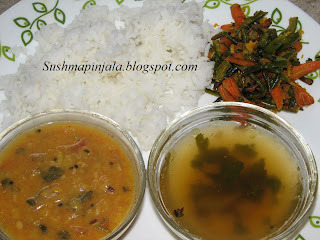 I have Packed my lunch box today with this sweet rasam, Tomato dal , beans carrot fryand rice. Today lunch box is packed with egg burji / curry with rice. This curry goes well with roti / chapati too. So here goes the recipe..
Heat 3 sps oil in a pan and add chopped onion, green chilies. Saute for few minutes and add ginger garlic paste. Cook till raw smell disappears. Now add 1/4 cup water, haldi , salt and chili powder. Mix well and cook till some bubbles appear. Now break 2 eggs and mix well. After a minute break rest of the eggs and do not mix too much. Cook on low flame till done. 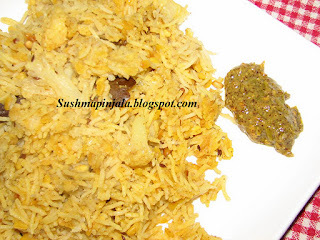 Garnish with cilantro and pack the lunch box with rice or chapati. I have served this curry with rice and store bought baked garden veggies. Boil water for 10 minutes and add cut frozen kantola/ aakakarakaya .